Whether its ease-of-use, check splitting or efficient ordering, the Duet Point of Sale (POS) system gives you all of the tools your restaurant needs to boost your bottom line while making customers happy. Easy to setup and use, Duet POS is a fast, low-cost Android solution that requires minimal investment and provides maximum results. It focuses on critical business issues that you face every day. You get robust operational functionality and the information needed to solve real business issues. Efficient ordering – Split checks, add discounts, update gratuity and taxes, or handle various other tasks. 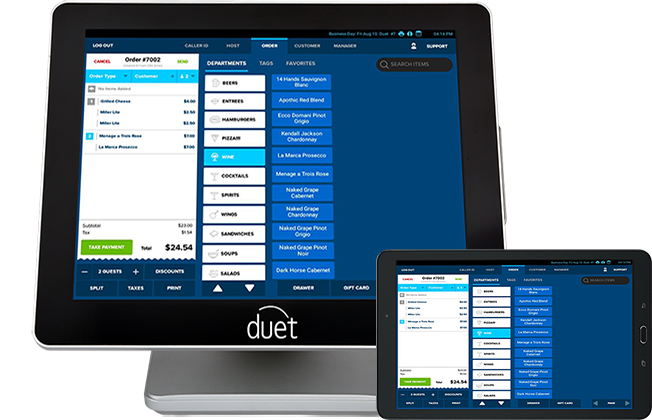 Online ordering and reservations – Manage orders and reservations with Duet POS system. Menu customization – Add, edit or remove menu items in real-time with a simple and intuitive interface. Organize menu items, categories and modifiers. Customer database – Quickly view customers’ order history and personal information. Robust reporting – Allows you to have remote access to your Duet POS system 24 hours a day, 7 days a week. View reports online, make changes to your menu remotely and manage employees from anywhere. Hybrid cloud technology – Maintain the advantages of a local system including faster speed and the ability to operate if the internet goes down. Employee management – track timesheets, calculate overtime, evaluate sales performance and manage security levels. Want additional information on Restaurant Manager Duet tablet solution?